When the engineers closed the flood gates on Denison Dam in February 1944 and the waters of Lake Texoma began to spread out behind what was then the world’s largest rolled earth-filled dam, few of the people involved in the dream of taming the Red River realized they were watching the beginning of what would become a magnet for people from all over. By late February, Lake Texoma covered eight hundred acres, but it was already attracting the attention of those who saw the recreation potential of the expanding body of water. The Corps of Engineers had built the three-mile long dam, just below the confluence of the Red and Washita Rivers, for flood protection and power generation, but at the time no one seemed to appreciate the recreation potential of the lake the dam created. Not until the 1980s was recreation added to the lake’s official purposes. The first permits for boats to use the lake were issued by the Corps of Engineers in May 1944. The first permits for boats to use the lake were issued by the Corps of Engineers in May 1944. Three years later, after roads were built and shorelines cleared, the federal government began taking bids for concession sites on the lake. One of the plum sites offered was Burns Run just off the Oklahoma side of Denison Dam. The winning bid went to Carl H. Browall, a businessman from Ada, Oklahoma. Browall got the green light to develop the area now known as East Burns Run in April 1947. Anxious to be ready for Memorial Day and summer, Browall set to preparing the site for visitors. Work crews bulldozed and graveled roads, cleared the beach and made it safe for swimming, and hauled portable concession stands to the site. Browall wanted Burns Run to be an attraction for people all over North Texas and Southern Oklahoma, and he succeeded beyond any expectation. By late July, the site had attracted an estimated 225,000 people. As development grew on the shore, Frank and Henry Wilburn, who owned a market in Denison, and a third Wilburn brother, Glenn, of Dallas, were looking off-shore for a way to tap into Lake Texoma’s growing tourism and recreation market. The idea they came up with was Texas-sized. They wanted to launch a Mississippi riverboat on Lake Texoma and offer excursion trips out of Burns Run. The boat they found was a wooden, seventy-two foot long stern wheeler named the Wanderer, based at Greenville, Mississippi. The three-deck vessel had a registered gross weight of sixty-four tons and a seventeen-foot beam, and she drew only two feet of water. After a difficult forty-two day trip down the Mississippi and up the cantankerous Red, the Wanderer reached Denison Dam. She was the first craft of her type to navigate the Red River to the Denison area since 1905, when another paddle wheeler, the Annie P, had arrived with cargo from Shreveport, Louisiana. At the dam, workmen hauled the Wanderer out of the river and onto a truck for the trip around the dam to a launching spot where old Highway 84 ran into the lake near Grandpappy Point. There, they slipped the boat back into its natural environment. With a capacity of two hundred people, the Wanderer would be the largest passenger boat operating on inland water in the Southwest. In the dawn of February 29, 1949, there was a fire aboard the boat. After an extensive remodel, including the installation of new diesel motors, the luxurious craft, with its ample space for lounging, dancing, dining and other recreational purposes, made a shakedown cruise before tying up off Burns Runs to await her public. But no passengers ever came up the gangplank to board the Wanderer, and the Wilburn brothers’ grand plans died three hundred feet off Burns Run before they could begin offering rides to the public. In the dawn of February 29, 1949, there was a fire aboard the boat. The Wilburn brothers, armed with fire extinguishers, rushed toward the burning craft in several small craft in an effort to save their boat and their dream. As they drew to within fifty feet of the paddle wheeler, there was an explosion, and the Wanderer settled beneath the calm water of Lake Texoma, coming to rest thirty to thirty-five feet below the surface. The loss of the Wanderer did not kill the idea of an excursion boat operating on the lake. In time, a smaller excursion boat would begin carrying passengers on trips around the lake. Meanwhile, ashore, Burns Run was booming. 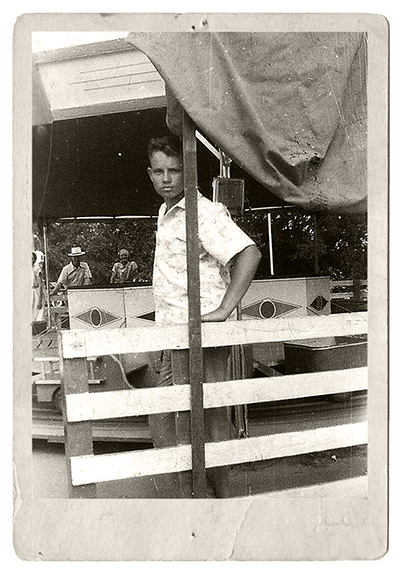 Wayne Bacon, a teen in the ’50s, worked at Burns Run operating carnival rides. Cartwright, Oklahoma, resident Wayne Bacon was an eyewitness to the birth and the eventual death of the famed Oklahoma attraction. As a teenager, Bacon worked at Burns Run, often running the rides for young visitors to the amusement park. Bacon recalled having the time of his life as he worked at Burns Run, riding his bicycle about a mile to and from the amusement park each day during the summer months. He said there were several rides aimed just at kids—merry-go-round, Kiddie Kars, an airplane ride and a train with an engine and three cars. It was a great job for meeting girls. 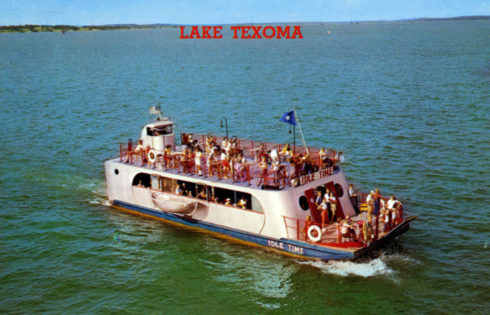 In 1951, Lake Texoma’s second excursion boat opened for business. G. E. Hibarger operated the boat, the Idle Time, and a sea plane and rented ski boats out of Burns Run, docking them all on the east end of the facility. “That boat really drew crowds for the cruise on Texoma. I think he charged $1 per person,” Bacon said. The Idle Time tour boat on Lake Texoma. The Idle Time was a forty-eight-foot iron and steel vessel that Hibarger had purchased at the Lake of the Ozarks and moved to Texoma. The double-decked boat ran regularly-scheduled cruises out of Burns Run, but made “ports of call” at Willow Springs Marina and Lake Texoma Lodge to pick up or discharge passengers. For most of the decade of the 1950s, Texas was caught in a historic drought. Beginning in 1950, extended periods of excessive summer temperatures and a lack of rainfall gripped the Lone Star State and much of the Midwest. Rainfall was off by forty percent and Lake Texoma was a natural attraction for people seeking escape from the oppressive conditions. Beginning in 1950… a lack of rainfall gripped the Lone Star State and much of the Midwest. The drought reached its pinnacle in 1956, one of the driest years in the state’s history, but the following spring there was a dramatic shift in Texas weather and by April 1957 the seven-year drought was over. For Burns Run and other resorts on the lake, low water troubles were coming to an end, but disaster was just over the horizon. As so often is the case in Texas, droughts end in floods. On May 18, just two months after Lake Texoma fell to an all-time low, heavy rains over the lake’s watershed pushed the level to record high of 629.07 feet. Five days later, history was made as water began trickling over the spillway for the first time since the dam’s completion, and still the rains came, turning the trickle into a steady flow and finally into a torrent. On June 6, Lake Texoma crested at 643.18 feet, more than twenty-five feet above its normal pool elevation. Four days later the water dropped below the spillway for the first time in two weeks. The historic flooding had crippled the lake’s major resorts. Burns Run with all its rides and attractions was demolished. The Idle Time survived the high water, but eventually fell victim to changing times. In the 1960s, new marinas rose on the lake to take advantage of the explosive growth of personally-owned boats and yachts. The Idle Time fell on hard times and by the mid-1970s, the rusting boat was an ungainly stepchild of the lake’s burgeoning flotilla. In the end, one of the most storied craft to ply the waters of Lake Texoma was cut up by welders’ torches and sold for scrap metal. She was not the last of her kind, however. 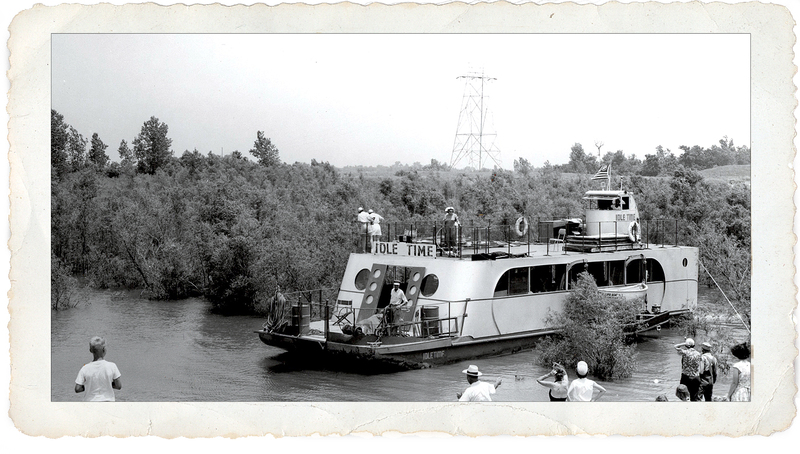 In the spring of 1987, another paddle wheeler, the Island Queen, began offering lake trips out of Cedar Mills Marina. The Island Queen was a sixty-eight-ton seventy-foot long, sixteen-foot wide steel-hulled boat approved by the Coast Guard to carry up to forty-eight passengers. She offered four daily excursions, including luncheon, dinner and moonlight cruises. On her scheduled runs, her stops included Highport Marina, as well as several other Lake Texoma resorts. The Queen was also available for private party charters. High water at the lake in the late 1980s took its toll on the paddle wheeler. After just two years of operations on Lake Texoma, the owners of the Island Queen called it quits and moved the boat to what they hoped would be more productive waters. With thousands of boats moored at Lake Texoma marinas, parked in dry land storage sites around the lake or hauled in every week on trailers, there is no shortage of boats on the lake. But with the untimely death of the Wanderer, the less-than-glorious end to the Idle Time and the departure of the Island Queen, the lake’s love affair with romantic paddle-wheelers and other excursion craft appears to have ended. But perhaps not. Perhaps there will be another chapter to the story. Is the boat still in waters? My favorite place as a child. It was a real treat to go for the weekend. We would spend the weekend go to the arcade and have the best time. We were little, and young but you did not have to worry about your children so much back then. We would pack up food and take for the weekend sandwich meat and of course breakfast items . Nothing like it . I loved the lights at night. We would play so hard we were glad to rest at night and hit it hard the next day. Good old See and Ski lotion, applied on your arms and face and have to set out 30 minutes before you could go back into the water after you ate. Wish I could do it all over again.